Who is Paul Picot? This was the first question. A quick search reveals a not-too-helpful flash based web site for the brand, which is apparently based in Le Noirmont, Switzerland and dates back to 1976. There’s a lot of fluffy language but not much real information about the company. They apparently sold in the USA for a while (Arizona Fine Time was a dealer) but appear to have exited the country (if not the industry) in 2013. One thing we can quickly see is that they have been actively selling a line of watches since the 1980’s at least. Most are nicely-finished and use classic movements from companies like Lemania and Valjoux, though the company doesn’t say much about this on their site. With all the interest in classic movements, I would think this would be a major selling point for the company. It certainly was for me! A query on TimeZine tells me that Paul Picot is still active, selling watches in Europe at least, and was quite popular in Italy a few decades back. It’s one of the many independent companies out there building watches in the Swiss etablisseur tradition by securing fine movements, cases, and such and assembling them by hand in the Swiss “Jura Triangle” watchmaking territory. The watch I found was a Paul Picot Firshire Chrono, Ref. 4031. This model is no longer listed on the Paul Picot web site, which is surprising since Auctionata lists a purchase date of 2012 and there are a number of similar tonneau-cased models listed in the classically-styled Firshire line. My next move was to the Internet Archive, which has versions of the Paul Picot web site dating back to 1999. After searching there, I found this exact watch listed back in 2000 but not past June 2004. The Paul Picot web site doesn’t say much of anything about the movements in their watches beyond what we can see: In this case, we have a hand winding two-pusher chronograph with a 30 minute counter at 3:00 and small seconds at 6:00. A search of the usual sites (Chrono24, eBay) reveals a few for sale, none of which contain much additional information. But there was one nugget in a Canadian eBay listing: “Cal. PP (1872)”. I immediately recognized that number as the Lemania 1872, a hand-winding chronograph movement with all the right features. We seem to have a match! I compared “my” Firshire Chrono to some of the listings and was pleased to see that it showed the correct strap and clasp and the text on the rear of the case looks right, too. Considering the evidence from Archive.org, I’m going to assume it was built before 2004, not 2012 as the auction listing says, though the wide availability of new old stock Paul Picot watches tells me it could have been purchased then. 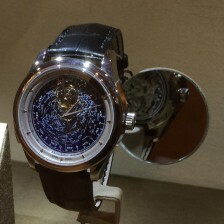 Am I interested in adding this watch to my collection? I love the look of the watch, and I’m attracted to oddball watches and movements, so I definitely would love to have a watch like this. Plus, amazing as it sounds, I haven’t got a single chronograph! But how much would I pay? It originally cost over $5,000 and similar watches seem to sell for about $2,000 so that puts a market price on it. As for me, the classic movement and fine condition make it worth about the same. I decided that the opening price of € 900 would be a bargain, so I would bid the minimum and not worry if it got away. Wouldn’t you know it – I won! No one else bid on the piece, which came up about an hour into the auction. This is lucky, since the earliest pieces attracted quite a lot of bidding, with a lull around this time before some of the more unusual and interesting pieces came later. Since this was an auction, the “hammer price” of € 900 was not the final selling price. I also was charged a buyer’s premium of € 180 which, along with shipping and insurance, brought the final price to me up to € 1,107 (about US$ 1,500). I took this into account when deciding on my bid, and feel that it represents a good value. Auctionata has a corporate policy of not shipping materials outside the EU which may be from exotic or endangered species. Since the Firshire Chrono came with a crocodile strap, mine arrived strap-less. But I did get the original box and papers, something I overlooked in the auction listing. The watch was in excellent shape with no obvious scratches or damage, indicating either a recent purchase (as claimed) or a “safe queen” that hadn’t been worn. The watch’s good condition continued inside with the movement seemingly in excellent condition. Although not highly decorated, it has obviously been well prepared for a home in this modern case. The Lemania 1872 is a cam-switched chronograph dating to the late 1960’s. It was part of a family of movements that failed to gain great traction due to the quartz crisis and the rise of the inexpensive automatic Valjoux 7750 family. But the calibre found a home in many luxury Swiss watches from Omega, Heuer, and Breitling. The case back is screwed on, which is interesting, and the tonneau case is very comfortable. The same cannot be said of the buckle: It’s positively “pokey” on the inside of the wrist, seemingly shaped all wrong. But the materials and execution are good overall. My main gripe is the face: The dial is finished with a lovely guilloche but it’s just oppressively dark, and the shiny hands are too fine to show up. Plus, the hands are too decorative and look all wrong in a sporty chronograph. It’s neither dressy enough to be a dress watch nor sporty enough for sports. And the legibility factor is a huge minus. Another off-putting element are the Roman numerals. They’re obviously applied (good) but weirdly shaped around the chronograph sub-dials. In particular, the “IIII” and “VIII” look odd since each “I” is a different length! It almost looks haphazard until you look closely and realize what they were going for in the design. Since it has 19 mm lugs, I quickly swapped in the black alligator strap from my Jaeger-LeCoultre Reverso Duo. This allowed me to wear the watch as originally intended, but it wasn’t ideal. These OEM straps are wonderful, made by Camille Fournet, but are short and thick, intended for the deployant rather than a buckle. Rather than risking permanent damage to my Reverso strap, I decided to order another. On seeing the watch in the flesh, I decided that a classic Alligator strap wasn’t right for a dress/sport watch like this anyway. Instead, I went searching for something to accentuate the compax chronograph face and give it a sportier look. My solution was a Di-Modell Rallye WR100m perforated black leather strap. It’s water-proof and I loved how the circular perforations mimic the watch face’s sub-dials. Overall I’m happy enough with the Paul Picot Firshire Chrono to consider it a good value. I wear it from time to time and enjoy having a classic movement in a hand-made Swiss watch that no one has ever seen or heard of. And it’s definitely well-made, notwithstanding the odd design choices. But I don’t find myself reaching for it all that often. My Breitling gets more wear as a chronograph (I like the tachymeter scale and the look), and my Nomos, King Seiko, and Jaeger-LeCoultre are my go-to dress watches.